There's quite a lot of extra content available for purchase in Haunted Hollow, the spooky new iOS strategy board game from Firaxis, creators of XCOM: Enemy Unknown. Between new creatures to add to your arsenal and special item unlocks, you could spend upwards of $17 on the free-to-play game, but that'd be stupid — the season pass is only $7.99. Every monster and all of the items currently available in the game for one flat rate. It's a notion that flies in the face of practices established by other big-name publishers in the mobile market. Those guys are here for profit. 2K and Firaxis want their players to party. Right, it's not quite that revolutionary, but it's enough to make me feel like I got a bargain, instead of establishing me as a customer who will purchase each additional season pass that comes out, regardless of content. I will, but I don't want to feel like I would. Every time a free game arrives on iTunes or Google Play overflowing with egregious in-app purchases, I have the same thought — "Why don't they just let me pay a fee to unlock everything at once?" With Haunted Hollows answer to the question casting an even more unfavorably light on common practices, it's going to get harder and harder for me to accept anything less than what's been done here. ...that. Memorize that, EA, Gameloft, DeNA, Zynga and friends. If you build that, they will pay. Of course it also helps if the game you're building it for is as brilliant a digital board game as Haunted Hollow. Accessible strategy is what Firaxis does best, and that skillset shines in the darkened mansions sending out famous monsters to do their evil bidding. There's a town you'd like to capture in a vice-like grip of terror, and you've got the tools to get the job done. Tools like Frankenstein's monster, ghosts, vampires, werewolves — the whole of General Mills supernatural cereal line is represented here (well, Yummy Mummy might be in the next batch, but no one likes him anyway). Some of them are there to frighten villagers. Some are there to fight your opponent's fiendish forces. Two players (pass-and-play, turn-based online or player-versus AI) take turns deploying their forces and collecting fear from the Hollow's luxurious-ish town homes. The more real estate you control, the more scare points you have at the beginning of each turn to perform actions. Scare too much and the church in the middle of town vomits up and angry mob, which slowly moves about the board between turns, burning buildings and destroying creatures on either side. When a turn ends with one player controlling all the town homes on the board, the dominating side is crowned the winner. Each monster is essentially a hero unit from a traditional real-time strategy game, with special powers activated by spending fright. The zombie, for example, may spend one fright in front of a town home to scare the resident and earn a zombie minion. Once he has enough minions, he can spend three fright to summon a horde, transforming into an attacking unit. 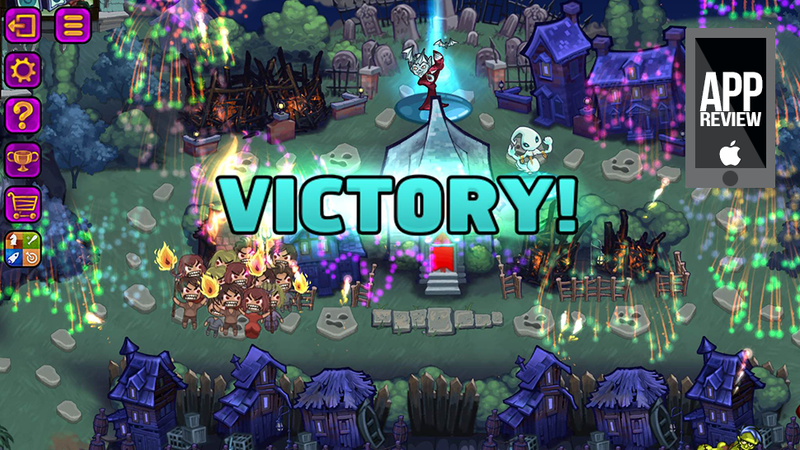 Meanwhile, in the mansion, players add one new wing per round, unlocking new troops or expanding upon an existing wing to craft more powerful minions. Simple enough, but as with most Firaxis strategy titles, if it seems simple that just means there's a ton of depth lurking beneath the surface, waiting for you to dig your way down. I'm not sure which is more clever, really — using cartoon renditions of classic monsters to lure new players into a genre they might normally avoid (the XCOM tactic), or getting me to spend $8 on a single iOS game without batting an eyelash. Either way, well done. May all of mobile gaming steal your idea and run with it.